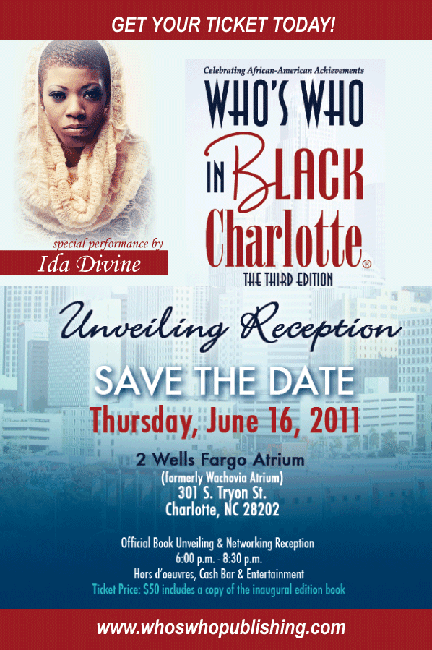 The third edition of Who's Who In Black Charlotte will be unveiled at a networking reception this Thursday, June 16, 6-8:30 p.m. at Wells Fargo Atrium in Uptown (301 S. Tryon St.). The book chronicles the achievements of African-Americans in the city, primarily focusing on their professional careers, and also spotlighting some of the companies and organizations that do a great job with diversity. I wrote a few of the "Interesting Personalities" articles in the book, where about a dozen or so people were chosen to be featured, each of them interviewed and profiled in two-page spreads. Other profiles in the book are shorter, about the length of a standard bio. And then there are sections on companies, and tribute stories, which are in-depth history pieces. It all comes together to highlight Charlotte's African-American culture in a way you don't often see in mainstream publications. At about 200 pages, it's a tall, coffee-table-style book. It's also a good book for our youth to see, so they can learn about the wide-range of career possibilities that exist, that might be far from what they can imagine in their current surroundings. Who's Who In Black Charlotte is produced by Who's Who Publishing, a Columbus, Ohio-based company that publishes these books in 25 cities across the country that have large African-American populations. The Charlotte book debuted in 2008 (I wrote for that edition), while cities like Atlanta have been published for more than a decade. However, as resourceful as these books are, I look forward to the day when they aren't needed. When minority groups will be featured more regularly and prominently in mainstream publications. But for now, they are a valuable tool. The unveiling reception usually draws a who's who type of crowd, ranging from the people being honored and their supporters, to representatives from corporate sponsors, to elected officials, and other prominent people in the city. So it's a good opportunity to network. Tickets for the event are $50, which you can purchase online, and that includes a copy of the book. There will also be hors d'oeuvres, a cash bar, and a performance by R&B/hip-hop singer Ida Divine. Has this book been produced for 2012?